Bryant Park Blog: What's the Weather at Bryant Park? What's the Weather at Bryant Park? A frequent call our receptionist gets is, "What's the weather at the park like right now?" Would-be parkgoers want to dress appropriately for our 12-months a year park, prepare adequately for inclement weather (although we really try not to cancel events unless Mother Nature forces our hand), and decide whether they want to join us! Now, you can know exactly what the weather is at any given time at Bryant Park. That's right, Bryant Park is a new weather station location collecting weather data for WeatherUnderground. WeatherUnderground takes the guesswork out of knowing the current weather at Bryant Park! The weather station overlooks the southeast corner of the park, sitting atop our Park House. Below is a "station's eye view" of the park! No, its not a toy helicopter--it's our weather station! 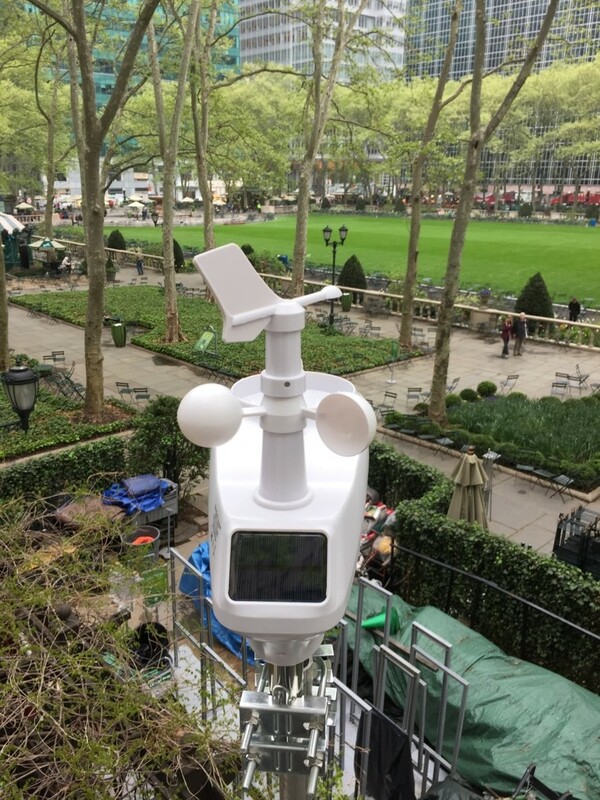 Now, you can know the weather at Bryant Park whenever you want! The station reports a wrong UV index value, maybe a shadow from something falls on its sensors. Thank you for the heads up. Our IT specialist looked into it, and you're right, the UV sensor was not correct. The weather station’s UV censor is very tiny, and the tree branches 20 feet above the weather station were blocking the sensor. IT did a UV censor calibration and the UV reading should now be correct. Thanks again!